Sharon Shinn is a master storyteller. My first introduction to her work was through the sci-fi Samaria series, and Archangel in particular. I adored the meticulous world building, the interplay between characters, and the central romances coming to fruition amidst politics and power. I also recently picked up Shinn’s quiet, emotionally intense paranormal fantasy, The Shape of Desire. 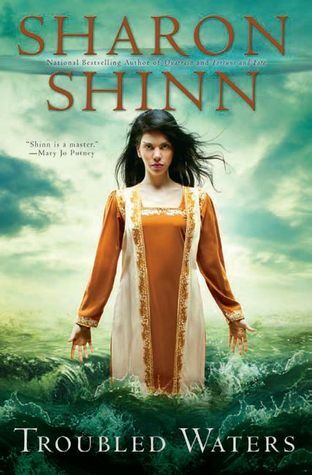 It only made sense to keep reading through Shinn’s backlist, so while on vacation this week I stayed up all night to read her high fantasy, Troubled Waters (no thanks to the cover art, which is... ugly. there, i said it!). It's there that Zoe realizes she is a coru prime ruled by the elemental sign of water. She must return to the palace, not as an unwilling bride for the king, but a woman with power in her own right. But as Zoe unlocks more of the mysteries of her blood—and the secrets of the royal family—she must decide how to use her great power to rise above the deceptions and intrigue of the royal court. Zoe Ardelay is a young woman living in a fog of grief. She has just nursed her father through his final illness, and now that he is gone, there’s a void where her future should be. She doesn’t know (or particularly care) what will happen next. When the king’s advisor arrives bearing the unbelievable news that she will become the king’s fifth wife, she leaves quietly – but Zoe has decisions to make, a fate to face, and a life to live. For what becomes of Zoe Ardelay is of mighty importance to her kingdom, her long-estranged family, and (she finds to her surprise) herself. While that summary may give you an idea of the situation at the beginning of Troubled Waters, it doesn’t speak to the world-building or magical system, which was (in my opinion) the best part of the book. Human beings in this world are governed by one of the five elements, along with the random blessings that they can draw in any temple. There is also an interesting juxtaposition between the strong (somewhat superstitious/fate-obsessed) belief system and technological developments and advancement. All of this mixed in with complex royal politics, trade, familial and personal alliances makes for a layered and nuanced background for a story about one woman finding her destiny. Shinn has written convincingly before of secret-keeping, loyalty and discovering what you want for yourself and your future. Troubled Waters is no exception. Zoe must rediscover her past, compare it to her memories and make a way (blundering at times) for herself. In doing so, she makes friends, negotiates class divides, finds unexpected power and unlocks dangerous knowledge that may bring change to the entire country. Zoe’s journey encompasses not only her own destiny, but also that of her wider world, and this signature ‘broad view’ is a specialty of Shinn’s stories. It sounds wonderful, doesn’t it? It should, if you like epic fantasy (and I do!). I found my reading enjoyment tempered by one thing: Darien Serlast. He is the king’s advisor, and a major player in Zoe’s life. However, I perceived him as a weakness in an otherwise wholly compelling story. He was meant to be mysterious early on, but because of that came across as an unknown for too much of the book, making it hard to connect with his character when he did begin to appear more often and reveal more of himself. That said, I found the book unputdownable, and my love of Shinn’s writing and world-building continues unabated. I’ll be waiting (not so) patiently for the next book set in this world of elemental power. Recommended for: fans of Kristin Cashore and Anne Bishop, those who enjoy high fantasy with unique magical systems, and readers who prefer their science fiction and fantasy with a thread of romance. I love epic fantasy and this element is what I'm looking when buying a book. Thanks for sharing. I've been meaning to try this one. Glad you liked it. I need to try more Shinn soon. I am so convinced that I need mass amounts of Shinn in my life, and this one sounds like no exception. She's one of those authors where it's almots intimidating to start, because they have such a large and amazing sounding backlog! Sharon Shinn makes me SOOO happy. I just read The Shape of Desire and it was great - can't wait to read Troubled Waters!